A pack of 4 compostable cellulose sponge cloths. Made of renewable raw materials (70% of cellulose, 30% of cotton). 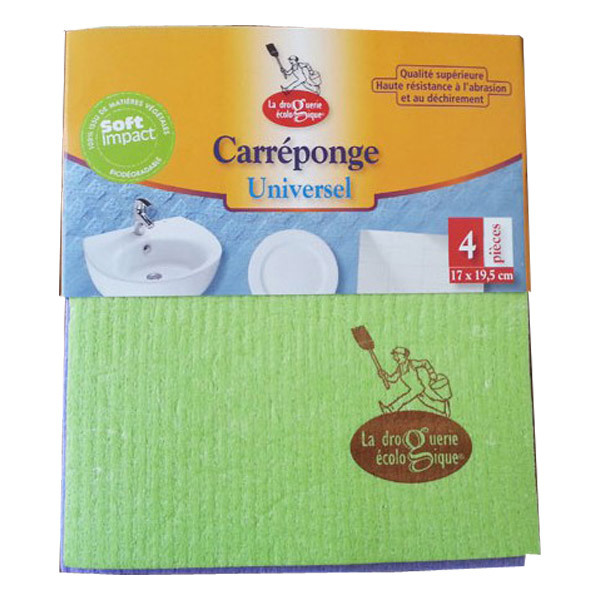 These sponges are particularly absorbent (5L/m²), durable, resistant to tear and abrasion. They are also lint-free and pleasantly soft. A pack of 4 compostable cellulose sponge cloths. Exclusively made of renewable raw materials (70% of cellulose, 30% of cotton). These cellulose sponge cloths replace classic sponges made of petrochemical compounds. These sponges are particularly absorbent (5L/m²), durable, resistant to tear and abrasion. They are also lint-free and pleasantly soft. This cellulose sponge is compostable, as it has been tested out by the EMPA (Swiss Federal Laboratories for Materials Testing and Research – Switzerland). Made in Western Europe. The label is made of recycled paper, printed with plant-based inks, printer certified Imprim’vert (eco-friendly printing).